Choosing the correct pharmacy technician school is essential. When potential employers see a quality school on your resume, then they know that you have been well trained for the job. You should first check your state's requirements to be employed as a pharmacy technician. Some states require that you go through a training course, certain approved training, on-the-job training, PTCB certification, registering with the State Board of Pharmacy, a combination of these or nothing at all. You can check your state's requirements on the State Requirements page. Choosing Training for more details on what to look for in a quality pharmacy technician school. 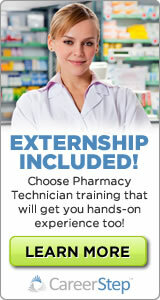 Time to Complete Training for more details on the average time it takes to complete pharmacy technician training.